My Grandmother Maria Sofia (Mary) KIVISTO was born on 20 July 1889 in Seinajoki, Vassa, Finland She emigrated to America in 1906, she was 17. She came with her brother Jacob’s wife and their 2 children. They arrived on the ship Astraea. 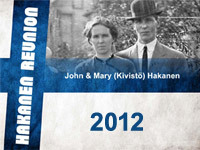 She married my grandfather, John Hakanen, January 23, 1907. She died on 11May 1966 in Nanty-Glo, Cambria County, PA. She was buried in the Finn Cemetery, Nanty-Glo Pa.
Grandmother Mary’s father was Johan Salomonpioka KIVISTO born on 23 April 1857 in Seinajoki, Vassa, Finland. He married Justiina Amalia LAHTI 17 October 1875. He died on 28 August 1926 in Seinajoki. His wife (Marys mother) was Justiina Amalia LAHTI born 23 March 1853 in Seinajoki. She died in Seinajoki, 18 May 1929. Grandmother Marys paternal grandparents were: Salomon Davidinpoika KIVISTO, born 10 August 1826 and died 2 October 1890 in Seinajoki and Sauna Johannintytar ALA-KORTESINIEMI, born October 1827 on Kortesniemi Farm, Nurmo, Vaasa, Finland. She died on 29 April 1917 in Seinajoki. Grandma Mary’s mother’s parents were: Salomon Marinpoika LAHITI born 12 August 1815 on Ala-Kortesoja Farm, Lapua, Vassa Finland. He died on 14 March 1868 and Sanna Jaakontytar HAVILA who was born 8 October 1821 on Rintala Farm, Ilmajoki, Vaasa, Finland. She died on 12 August 1874 in Seinajoki. Juho Daavid Jeremiaanpoika LANGSTROM, born 27 June 1797 in Nurmo, Vaasa, Finland. He died 14 July 1857 on the Uppa Farm in Seinajoki. He married Lisa Antintytar (surname unknown) on 27 December 1824 in Nurmo. Lisa Antintytar (?) was born on 24 November 1803 in Holsola, Ylistro, Vaasa, Finland. She moved to Ilmajoki parish in 1862. We also have: Juho Iisakinpoika ALA-KORTESINIEMI, born 12 September 1789 on Niemisto Farm, Nurmo, Vaasa Finland. He married Kaisa Yrjontytar (surname unknown) 13 November 1814 in Nurmo. His wife was born 28 June 1790 on Ala-Kortesniemi Farm. She died 9 July 1861, on the farm where she was born, the Ala-Kortesniemi farm.